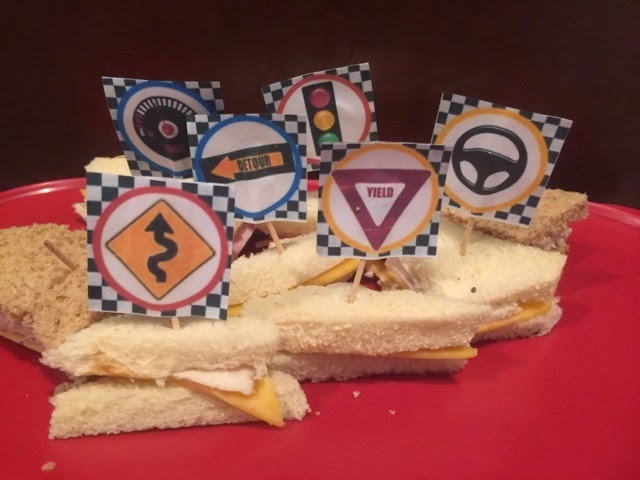 Home DIY Food DIY Cars themed birthday party! My son just turned 3 and is in love with all things cars especially Disney's lightening McQueen. This year we threw him a birthday party at a local gymnastics place and invited his daycare/preschool class. 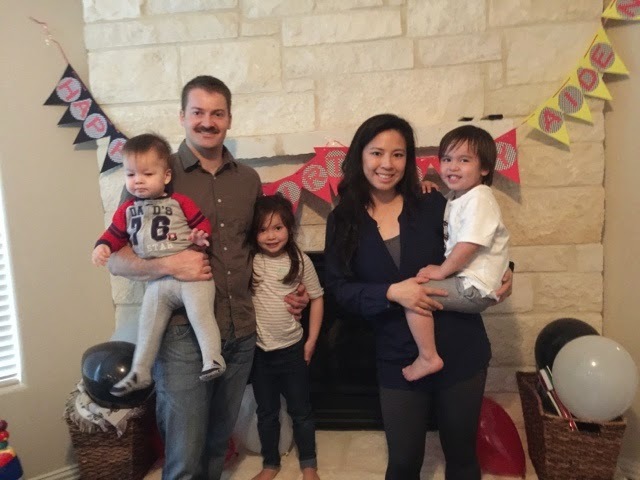 With a little bit of work this turned out to be a budget friendly party and he loved it! I made a happy birthday banner using the black and white racing checkered pattern for the background and red letters using adobe illustrator. I printed the letters out onto regular paper and cut out the circles. I used the triangle template from sweetbeanz blog to cut black, red and yellow card stock and that template can be found here. Then I glued the circles onto the triangles, used a 2 hole punch for the tops of each triangle and threaded a white ribbon through the top part of it. I downloaded a water bottle wrapper template for free here and used adobe illustrator to remove the nutrition label and qr logo. 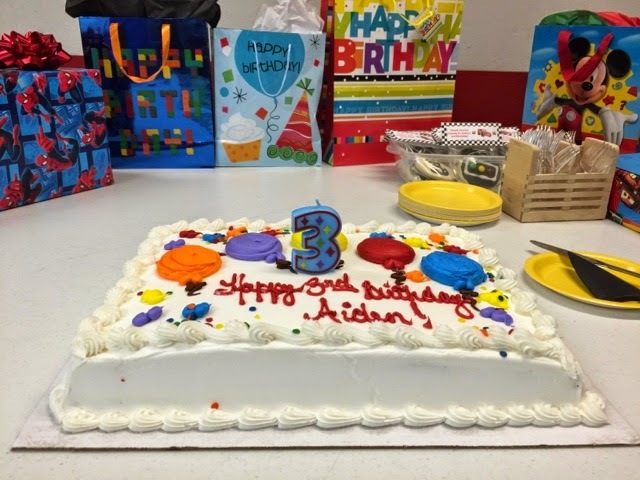 Then I added in the text to personalize it with 'Aiden's 3rd Birthday'. 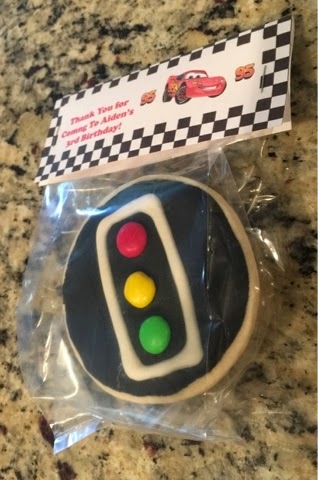 The other label already had the lightening McQueen image on it. I printed this on regular paper and cut them out. Then I ripped off the Costco label from the water bottles and taped my labels onto them. I printed out a lightening bolt that I found here on regular paper then used a glue stick to place it onto red card stock. Then cut the red card stock paper just a tad bigger than the lightening bolt to create a border. I covered a small card board box with white tissue paper and taped on the lightening bolt. I used this box to hold the snack sized packs of chips I had purchased from costco. 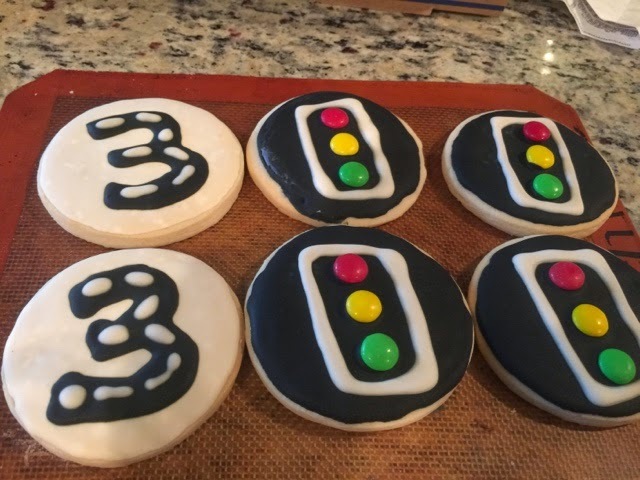 I found road sign cupcake toppers here and printed two of the same ones out. 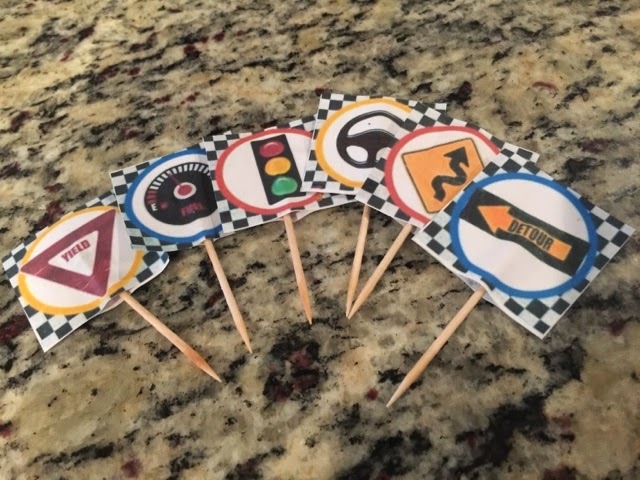 Cut them all out, added a toothpick and used a glue stick as well as a piece of tape in the middle to stick the matching cupcake toppers together. These I used to on top of the sandwich triangles to keep them together. 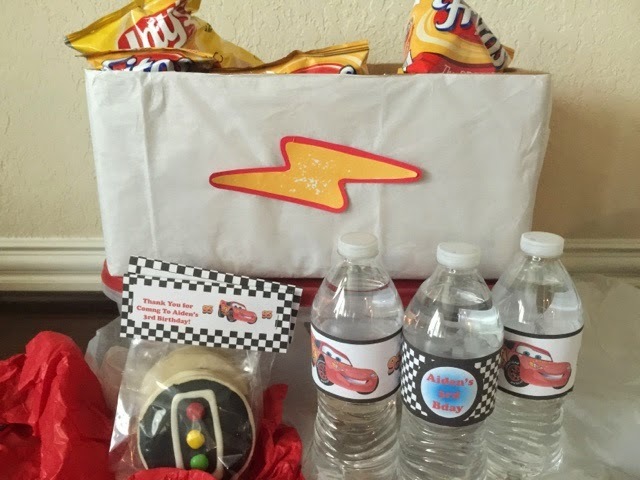 Overall it turned out to be a great Cars themed birthday party and it didn't break the bank. Not pictured, I decided to buy a Cars plastic table cover and two plain black table covers, Cars themed napkins, and a few packs of paper plates for the food and cake. I already had most of the items needed for the party on hand such as the card stock paper, baking ingredients for the royal icing sugar cookies, water bottles, plastic utensils, fabric, etc. 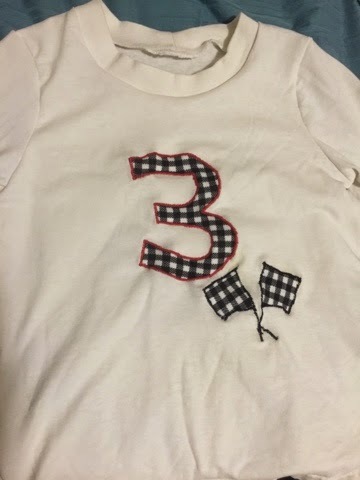 If you decided to do something similar and had to pick up those items in order to do it yourself it is definitely still cheaper than ordering all the decorations and the personalized t shirt from Etsy!